What suggestions do people have for quickly calculating dihedral angles in Python? What's your best for calculating angles in the range 0 to pi? What about 0 to 2pi? "Best" here means some mix of fast and numerically stable. Methods that return values over the full range 0 to 2pi are preferred but if you have an incredibly fast way of calculating the dihedral over 0 to pi share that too. Here are my 3 best efforts. Only the 2nd one returns angles between 0 and 2pi. It's also the slowest. arccos() in Numpy seems plenty stable but since people raise this issue I may just not fully understand it. The use of einsum came from here. Why is numpy's einsum faster than numpy's built in functions? The diagrams and some inspiration came from here. How do I calculate a dihedral angle given Cartesian coordinates? # lie in parallel planes. # Use the relationship between cos and dot product to find the desired angle. # "How do I calculate a dihedral angle given Cartesian coordinates?" # is the dihedral angle. As you can see in the benchmarking, the last one tends to be the fastest while the second one is the only one that returns angles from the full range of 0 to 2pi since it uses arctan2. Here's an implementation for torsion angle over the full 2pi range that is a bit faster, doesn't resort to numpy quirks (einsum being mysteriously faster than logically equivalent code), and is easier to read. There's even a bit more than just hacks going on here -- the math is different too. The formula used in the question's dihedral2 uses 3 square roots and 1 cross product, the formula on Wikipedia uses 1 square root and 3 cross products, but the formula used in the function below uses only 1 square root and 1 cross product. This is probably as simple as the math can get. uses 1 sqrt, 3 cross products"""
1 sqrt, 1 cross product"""
The new function would probably be a bit more conveniently called with 4 separate arguments but it to match the signature in the original question it simply immediately unpacks the argument. The functions can be tested with pytest as pytest ./test_dihedrals.py. new_dihedral is about twice as fast as old_dihedral2. If you want to get even more aggressive you can use pypy. At the time of writing pypy doesn't support numpy.cross but you can just use a cross product implemented in python instead. For a 3-vector cross product the C pypy generates is probably at least as good as what numpy uses. Doing so gets the time down to 0.60 for me but at this we're wading into silly hax. Form the vectors b4 = b1/\b2 and b5 = b2/\b4. These form an orthogonal frame with b2 and the length of b5 is that of b2 times that of b4 (as they are orthogonal). 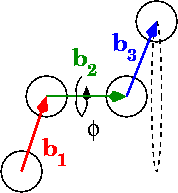 Projecting b3 on these two vectors gives you (scaled) 2D coordinates of the tip of b3 as on your second figure. 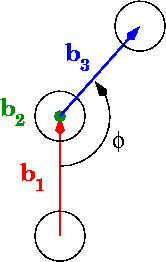 The angle is given by atan2 in the -Pi..+Pi range. Similar to your dihedral2. 12 adds, 21 multiplies, 1 square root, 1 arctangent. You can rewrite the expression for b5 using the expulsion formula, but this does not really help. CAUTION: I didn't thoroughly check the signs/quadrants issues! Here's the definitive answer. The authors have python versions available as well as the C version. Not the answer you're looking for? Browse other questions tagged python math numpy or ask your own question.